Despite the efforts of both teams Tonga and Cook Islands were inseparable after 90 minutes. Samoa have all but secured passage to the OFC U-16 Championship in Solomon Islands after a 10-3 battering of American Samoa at the Qualifier in Tonga this morning and were helped along when the hosts played out a scoreless draw with Cook Islands. With six points from two games Samoa have a four point lead over their opponents in the standings which makes them statistically impossible to catch especially when combined with the goal difference they attained today. Samoa made a quick start of it as Kawasaki Soafaiga found the back of the net twice in the first ten minutes, before John Tumua Leo added a third in the 14th. They were soon out to a four goal lead when Falaniko Nanumea fired home in the 22nd minute. Martin Tamasese’s side slowed up and let their opponents get a taste of possession and a run into the penalty area towards the end of the half resulted in referee Ben Aukuwai of Solomon Islands awarding in American Samoa’s favour. Captain Gabriel Taumua stepped up, firing the ball past goalkeeper Semu Faimata, but Samoa hit back almost immediately through Nanumea. Taumea then rattled the net with a long-range shot in added time to give his side some hope at half-time. Coming into the second half it took some time for the two sides to settle back into the pace they’d set prior to the break. But when a second foul was committed in the Samoa box this time Taumua stepped aside from penalty duties and allowed Peter Lauvao to secure his first international goal for American Samoa. It looked like the side might be heading in the direction of an equaliser however a lapse in concentration at the back was leapt on by Tumua Leo who had his second of the match in the 74th minute. Three minutes later and it was Samoa’s captain Lotial Mano who was eying up the goal from the penalty spot, making no mistake as he fired past substitute keeper Hengihengi Ikuvalu for Samoa’s seventh. Feituao Belcher got on the scoresheet with a belter from outside the area, before Jarvis Filimalae scored twice in added time to take Samoa to double digits. Samoa coach Martin Tamasese said his side opened the match well, but took their foot off the accelerator which allowed their opponents back in. “I think the boys when they scored those four goals they think it’s done but I sent a message that the game is 90 minutes,” he said. Tamasese was also pleased his side isn’t reliant on just one or two goalscorers, with today’s game proving the team is adept at finding the net from all over the park. It was another hugely disappointing result for Ruben Luvu who was surprised to see his side overrun by the Samoans. “It’s really disappointing, we didn’t expect an outcome like this, the score,” he said. Luvu had to make an early change with goalkeeper Antonio Nauer coming off in the 19th minute and replaced by Hengihengi Ikuvalu, but Luvu said it’s unlikely that was the sole reason for the heavy defeat. In the afternoon encounter Tonga were keen to continue the momentum of their opening game which saw them comeback from two goals down to take a share of the points from American Samoa. Cook Islands meanwhile were looking to put the hurt of an opening loss behind them and hopefully put some goals in the net and points on the board. Both teams started strong although it was the Cook Islands forcing the first save from Viliami Lui. A couple of minutes later and Siana Short was called into action when a free kick was popped into his area. Those two early efforts and subsequent saves from either side set the tone for the remainder of the match with the backlines of either side proving too tough to break down despite numerous opportunities for either side. The disappointment of having chances that went unconverted was tough for both coaches when the final whistle blew, knowing that progression was now out of their grasp. “I’m really disappointed with the fact we had chances up there but just couldn’t put it away,” Cook Islands coach Anthony Samuela said. Missed opportunities was a sentiment shared by Samuela’s counterpart Lafaele Moala who said that was the biggest weakness for his side today. “The finishing just wasn’t there, it was our weakness today. We had a lot of chances but didn’t end up with the goal and so there’s room for improvement before the last game,” he said. 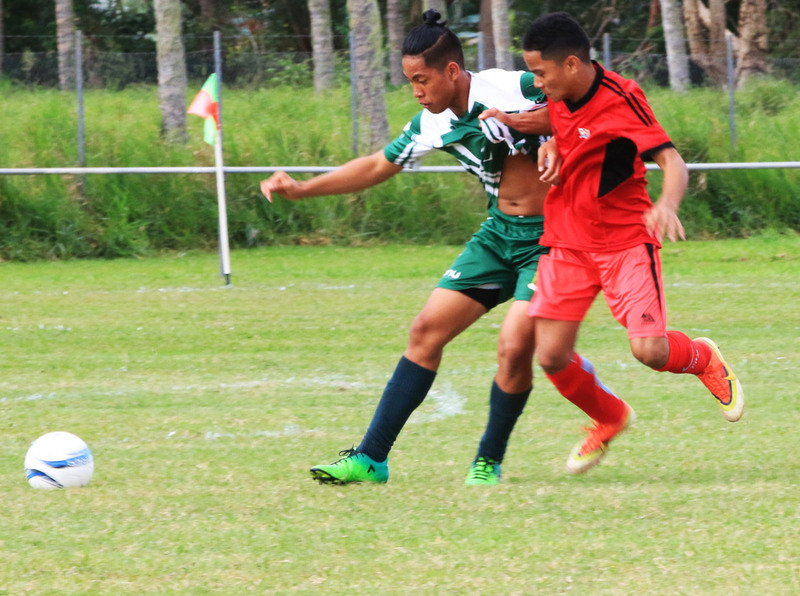 The OFC U-16 Championship Qualifier returns for the final day of action at the Loto-Tonga Soka Centre on Friday 20 July.